It came as a great surprise to everyone living in Glasgow, a place renowned for its cold temperatures and rainy weather, that summer 2018 came with some of the hottest days recorded. Therefore, to aid your wintery desktime daydreams of summer 2019, Ringwood is recommending the three best parks to read a book in on a sunny day. 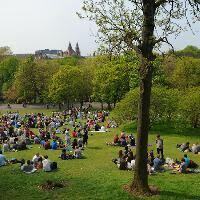 The first park that Ringwood has selected is Kelvingrove, the classic example of a Victorian park within Glasgow. The design of the park, coupled with its setting onside the banks of the River Kelvin, both enhance and compliment the beautiful architecture which surround the world-renowned Art Gallery and Museum that are a prominent feature within. The park also offers a wide variety of facilities to suit all age groups, including a bandstand, five bowling greens, 3 children’s play areas, and more. So, next summer when the sun makes an appearance, why not pack the family up, drive to the park and soak up the rays while devouring a Ringwood book? This East End park is particularly popular with local residents, and throughout the wider community. Alexandra is a pleasant park, with the highest point of it giving views to Ben Lomond in the North, and to Tinto Hills in the South. The main entrance for pedestrians is through the park’s ornament gates. With four bowling greens, children’s playgrounds and a small picnic area, this park provides a perfect backdrop for a spot of reading on a warm summer’s day. Springburn Park is home to not only a beautiful rockery, but a garden of peace and three separate wildlife ponds as well. A vast collection of flowers are planted throughout the park, making it a gorgeous place to wander through in the height of summer. This particular park can also boast of a football pitch, a multi-purpose games court, three bowling greens and is the site of Glasgow City’s Health Walks. So if you’re thinking of doing a bit of reading in the great outdoors, why not stop here and read amongst the flowers?